The combination strawberry/vegan gelatine/custard is delicious, add to it a crunchy crust and you have the perfect tart. This dessert is a delight to the eyes and the taste buds, a sophisticated desert that will impress your friends. Place all the ingredients except the water in a bowl. Using a fork, mix the ingredients. Then slowly drizzle the cold water, a tablespoon at a time, over the flour, mixing with the fork quickly until the dough starts to clear the sides of the bowl and comes together. Place the dough in cling wrap and let it rest in the fridge for one hour. Take the disc from the fridge and roll it out to about 12 inches, using as much flour as you need to keep it from sticking to the surface. Open the dough on a greased 8 inches round spring form baking tray. Bake the crust at 180C for 15 minutes or until light golden. Open the baking tray and carefully remove the crust from the tray and let it cool. Spread the vegan custard at the base of the crust. 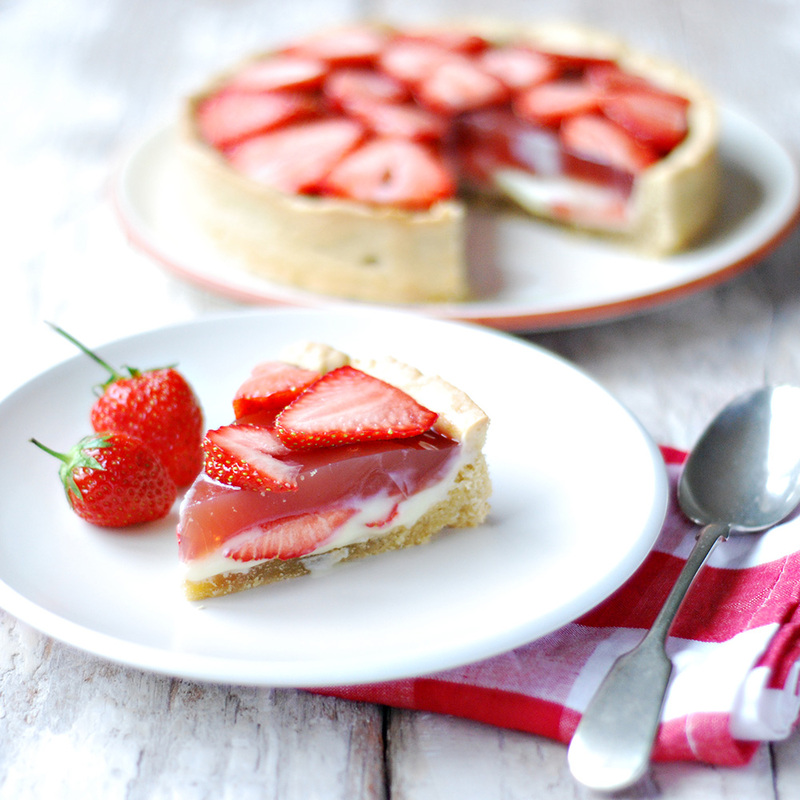 Lay half of the sliced strawberry on top of the custard to cover the entire surface of the tart. In a sauce pan mix the juice and agar-agar and bring it to boil, stirring from time to time. Turn the fire off and stir it for about 10 minutes or until it cools down to body temperature. Pour the gelatine on top of the strawberry and lay the rest of the strawberry slices on top of it.